We question the quality of this version since it doesn't seem to stand up to the heavy-handed artists that older versions typically saw. We list an alternative in our review. The Doodle Pro is a small, portable doodle pad. No batteries are required to draw. A small pen is included that is attached to the drawing board so it does not get lost. While many users said they purchased this version in order to carry along on car trips or to waiting rooms, they were often disappointed that it quickly seems to break down. Drawings can be hard to erase, leaving shadowy outlines, while some parts of the screen may acquire permanent marks if pressed too hard. 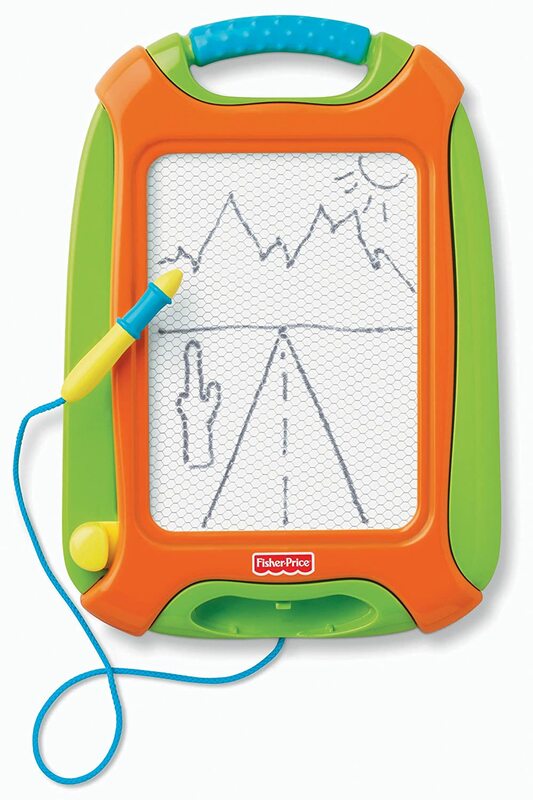 Overall, we think this travel sized magnetic drawing board is a better option. A small magnetic drawing board with a sliding eraser lets kids create endless doodles. The small drawing pen is attached to the board by a small string, keeping the pen from getting lost. No batteries are required. The lines will all show up black as this particular doodle board does not have any colored backgrounds. Draw a doodle. Erase a doodle. Draw another doodle. Most users purchased this particular board for its small size, making it easy to take along in the car. However, the quality is nothing impressive, as many users have complained that the black lines are sometimes difficult to fully earse. This leaves shadowy lines that are always present as new drawings are created. Even when the lines are erased, there are a number of small gray dots that may be seen across the screen. A handful of users found that certain areas of the screen (commonly the lower left corner, though other areas have been reported) break when too much pressure is applied. The screen itself won't crack, but the black magnetic dust will cling to that portion of the screen, and can never really be erased, leaving a big splotch. This does not seem to happen very often with children who know how to draw lightly, but younger children and toddlers may find this difficult. Those who were pleased with this toy found that it works well for practicing numbers and letters, and used it more as an educational tool than an entertaining toy. All parts and pieces are included in the package. This toy does not need batteries. Several users had concerns that the board was not completely erasing pictures. After a picture would be erased, there were small gray dots from the previous drawing and you could still see the picture in the background. This made it harder to draw something new. Some said that this only happened when the pen was pressed down very hard on the board, so to prevent this, we recommend using only with children who have developed the motor skills needed to draw gently. 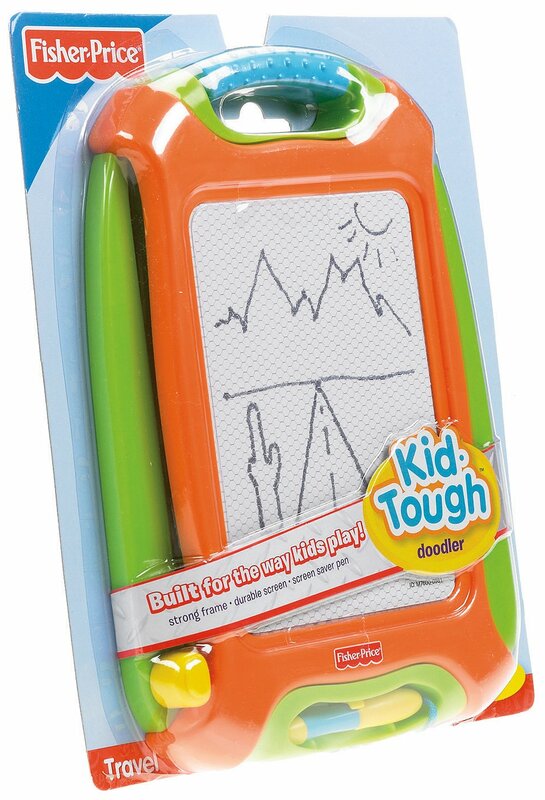 The Doodle Pro Travel is sized just right for on-the-go, mess free, magnetic drawing fun! The screen saver pen is attached so it can't get lost, and the easy-slide eraser clears the screen like magic so little ones can draw up new creations over & over again! Plus, the durable frame includes a built in handle, so it's easy for kids to carry, wherever they go.